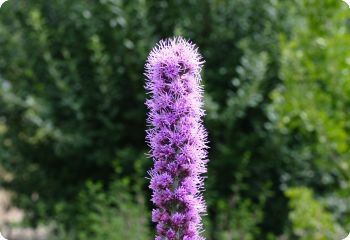 Liatris pycnostachya has very tall, dense spikes of purple flowers that attract hummingbirds and butterflies in late summer. It looks like an exclamation point in the middle of the perennial border or wildflower garden. Liatris pycnostachya is a drought-tolerant, native perennial. It's popular for prairie gardens and restoration projects. It makes a terrific cut flower. Also known as Prairie Blazing Star and Kansas Gayfeather. Deer resistant. Hardy in zones 3-9. Start liatris seeds indoors in winter. Barely cover the seeds with soil, then refrigerate for 8 weeks. Full sun to part shade. Spacing 15".